Chalktrail: Create a trail of chalk behind any size bicycle. Create a trail of sidewalk chalk behind any bike. 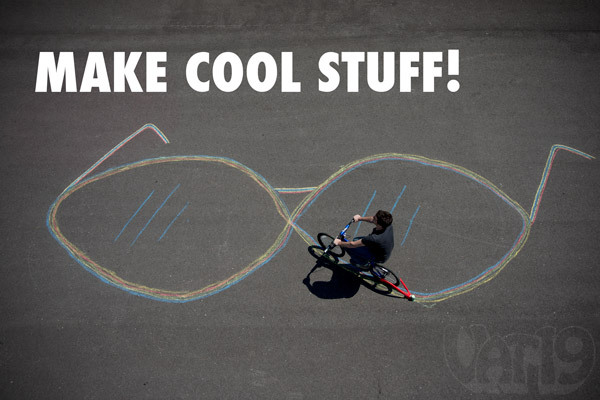 Snap Chalktrail to the back of your bike and draw a line of chalk wherever your bike goes! Draw simple paths, twisting curves, figure eights, perfect circles, or grab a group of friends and create gigantic spirograph-like designs. 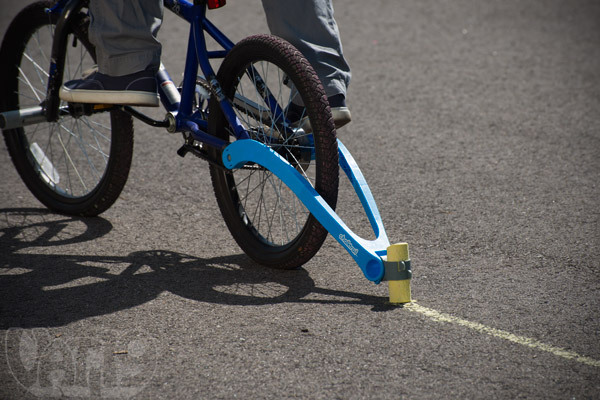 The Chalktrail easily slips around a bike's rear axel for a snug and secure fit without using tools! Then slide a piece of chalk into the Chalktrail's clamp, and you're off! One piece of chalk is included and will last for up to 1.5 miles of drawing. 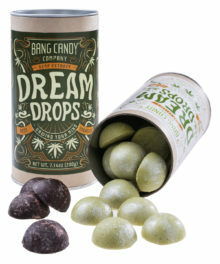 Replacement sets of the non-toxic, washable chalk are also available. Dimensions (Chalktrail): 23.5" x 5" x 4.25"
Hansel and Gretel would've loved Chalktrail! Place the Chalktrail onto the rear wheel of any bike, load it with a piece of chalk, and leave a thick trail of sidewalk chalk in your dust. It's pretty much the most efficient way to "tag" a parking lot. And that's the way we like it. 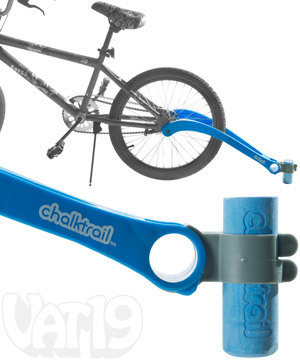 Create an awesome trail of chalk behind your bike with the Chalktrail. What makes the Chalktrail so amazing is its simplicity. 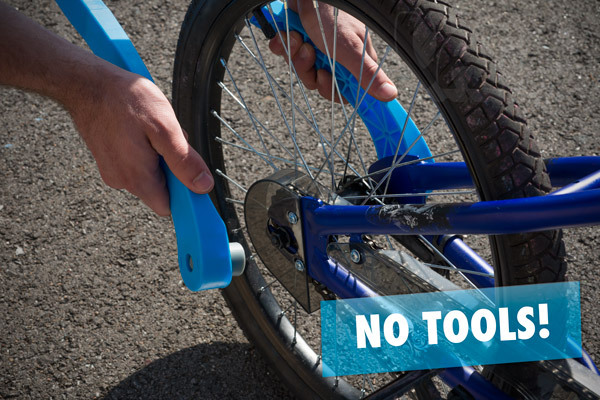 The wishbone shape and flexible materials allows it to slip on and off any bike without any tools. It will take about 5 seconds to put on to your bike. Seriously. Snap the Chalktrail onto any bike in seconds. No tools necessary! 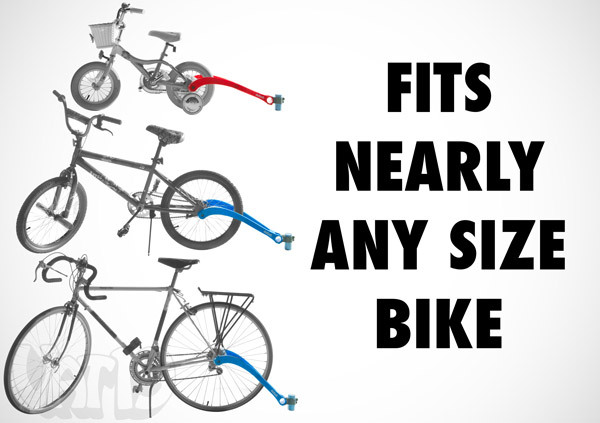 Bike wheels come in many different sizes (12" to 29" diameter). The Chalktrail fits them all — even if there are training wheels present! The Chalktrail's smart design also allows you to adjust the angle of the chalk holder to accommodate different wheel sizes. This means that the chalk line will always be thick and bright regardless of the type of bike being used. Adjustments to the angle are simple and easy (think seconds). 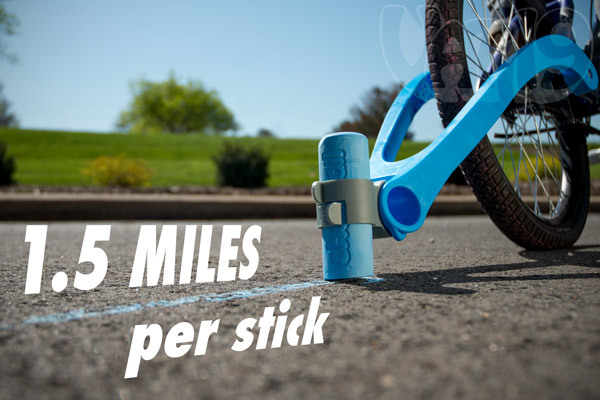 The Chalktrail is designed to fit on any size bike wheel (12" to 29" diameter). Each Chalktrail comes with one piece of chubby sidewalk chalk that will last for up to 1.5 miles (2.4 km) of riding! Chalktrail chalk will draw for over a mile before needing to be replaced. Purchase extra chalk for marathon Chalktrail sessions! 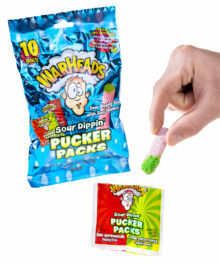 Your Chalktrail will come with one piece of chalk (in a random color). Extra chalk can be purchased in convenient 4-packs (that's 6 miles — nearly a 10k — of trails!). 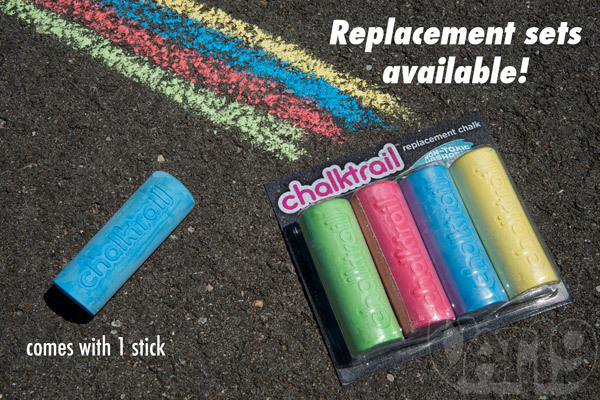 Add a four-pack of replacement chalk for days of Chalktrail playtime. Chalktrail can be used for more than just random lines and curves. You can make some pretty amazing designs with a Chalktrail, your creativity, and a bit of planning. Chalktrail is all about fun. So buy a few and turn that average asphalt into a colorful canvas! Question: Will it work on my bike? Answer: Yes! Bike wheels come in 6 different wheel diameter sizes (12" to 29") and the Chalktrail will work on any of those sizes. Its frame attaches to the bolts of the wheel axle without any tools or fuss. Simply spread the wishbone-shaped frame of the Chalktrail and release it onto the bolts. Simple! Question: What if my bike has training wheels? Answer: No problem. The Chalktrail works just fine with training wheels. Question: Can I use any sidewalk chalk? Answer: No. Traditional sidewalk chalk is too thin and brittle for the high speeds of bikes. Therefore, the designers of the Chalktrail had to design their own chalk which is far thicker and more dense than sidewalk chalk. And we're glad they did! Chalktrail chalk works at high speeds, even when turning, and each piece lasts for up to 1.5 miles of riding. Question: Where do I buy more chalk? Answer: Right here at Vat19! We have replacement sets available. 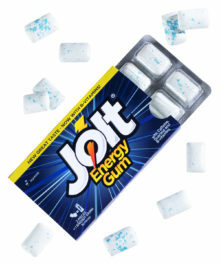 Question: Is the chalk safe? Answer: Absolutely! Chalktrail chalk is non-toxic and washable. Question: Can I specify the color of chalk that I want? Answer: Sorry, but the included piece of chalk is of a random color. However, you can choose between a red and a blue Chalktrail frame. Of course, we find it easier to buy one of each. You don't want jealous friends stealing yours, do you? Exactly. 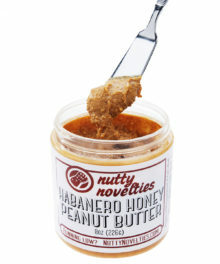 So, buy, buy, buy!